Real estate WordPress plugins can give an agent’s website a tremendous visual boost with image galleries, charts and maps. According to a recent study of visitors to agent websites, 60% of those surveyed said they spend most of their time looking at the image of a home than the description text. Another study showed that articles with images generated 94% more views. That’s nearly twice as many views as those without images. We live in a visual age. The result of digital living. Guess why Instagram and Snapchat are some of the most popular websites in the world? Because they are all image-focused. That’s not to say the Facebook is not visually-focused. Take a look at a Facebook page and it’s all images and very little writing. Another report found that Facebook posts with photos get 37% more engagement. Twitter – another immensely popular website – is not known for its long diatribes of text, but for getting your point across with 150 characters or less. And on Twitter, it’s mostly images. If you don’t include an image in your post, then your post looks like an afterthought, wedged between a constant stream of photos and artwork. Sometimes it easier to create words than it is to find or create images. After all, all you have to do is sit at the keyboard inside your office and start typing. But as we said, in today’s day and age, people aren’t textual oriented. Fortunately, when it comes to visuals, WordPress is a great platform. What? You don’t have a WordPress real estate website? Uh oh. Then you are missing out. WordPress is so popular as a website platform, it has captured about 30% of the world market. The website is one of the easiest content management systems on the planet meaning it’s easy to add pages, blogs, text, images, whatever. WordPress is also coded to be one of the most search-friendly websites in the world. So it gives brokers and agents an advantage when it comes to appearing on Page 1 on Google or Bing for targeted keyword searches. We won’t get into those details in this blog. What we will talk about is the other tremendous advantage of WordPress – plugins, specifically real estate WordPress plugins. And how those real estate WordPress plugins can instantly give your website powerful visuals. There are now more than 50,000 plugins available on WordPress. This is one of the big factors that made WordPress so popular. Basically, a plugin is like an app on an iPhone or a smartphone. We know how powerful those apps have been in making smartphones the most popular machines in the world. Now, let’s talk specifically about real estate WordPress plugins. Home Junction provides real estate WordPress websites for brokers and agents. But the company has also developed its own line of popular real estate WordPress plugins. Take real estate market data for example. When you add the Home Junction real estate WordPress plugin for sales data, you can add charts to your website showing real estate market data trends in your area. For example, you can show a chart illustrating the Number of Sales by quarter. A visitor to the website can also tailor that search to the type of property they are searching for, whether it’s a home, condominium, townhome, etc. This next function is critical. Home Junction is a national data aggregator that gathers data in more than 1,000 categories. They include parcel size, square footage, recent home sales, municipal boundaries, school enrollment, etc. Really deep, in-depth property and neighborhood information. So if a visitor is looking for market trends in the area, they are not just limited to sales activity in the county, but can drill down to the city, zip code or even neighborhood level. This is a tremendous asset for an agent who wants to farm a particular neighborhood. 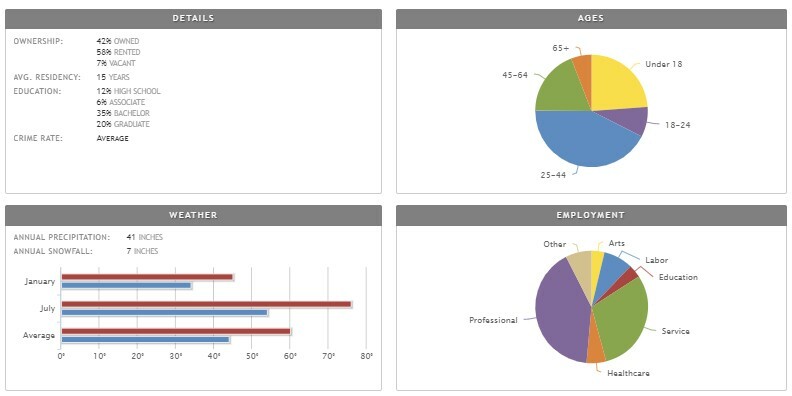 Displaying this breakdown of data per neighborhood really makes that agent the agent with the most hyper-local knowledge. Here’s another powerful real estate WordPress plugin offered by Home Junction. With this plugin, an agent is able to add maps for the neighborhoods they are farming. Maps you might say? So what? Anybody can add a map to their website (sort of). 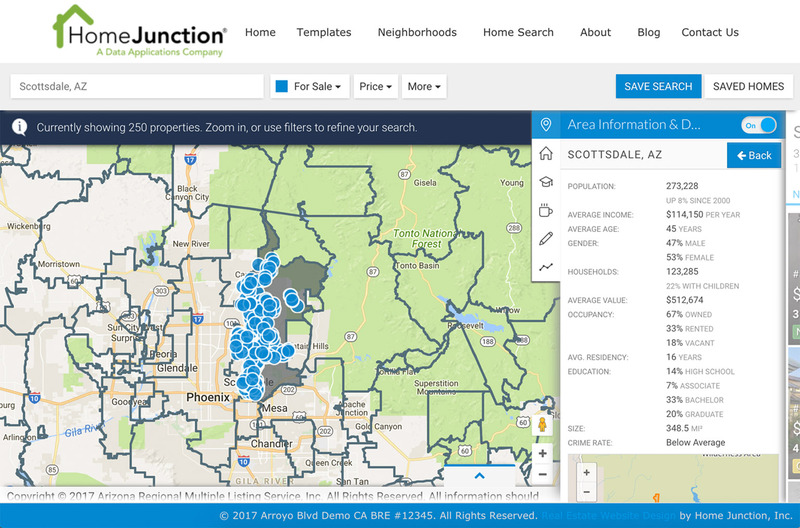 With this Home Junction real estate WordPress plugin, the map is integrated with the local MLS database. The agent can display homes for sale from MLS on the geo-spatial map. That geo-spatial map is also integrated with several other databases. On the map, visitors can see the boundaries near a property. Municipal boundaries (very important in terms of taxes). Here’s another database that is included in the SpatialMatch real estate WordPress plugin – local businesses. As brokers and agents know, neighborhoods can sell a property for them. If Mrs. Stretch loves yoga, you can point out the local yoga studio that is just a mile away from a property. If Mr. Teetime is your prospect, don’t tell them where the local golf courses are located, show them how close they are with your geo-spatial real estate WordPress plugin. \There are other real estate WordPress plugins with eye-appealing impact that can also influence and impress a visitor to an agent’s website. Home Junction also offers WordPress plugins with demographic data. Neighborhood demographics such as an overall profile of who lives in a particular neighborhood – their education, income and ages. The Cost of Living for that particular neighborhood as well. Are prices higher or lower than the national average? Compare the cost of living from one area to another. With just a quick glance, a visitor to an agent’s website can see if they feel that neighborhood is a good match for them. For a family with young children, they will want to see charts displaying a neighborhood with other young children. For older folks, maybe they prefer a neighborhood where most of the people are their age. All of these graphical elements are not just to impress buyers either. Imagine you are pitching a person with a $2 million home to be their listing agent. Imagine the impact you will have when you show them all those visual charts indicating how you are going to market their property. It’s not just talk. It’s real research. Real estate market data presented in a very powerful manner. As we said, plugins are one of the big reasons for the success of WordPress. Take advantage of this technology and add real estate WordPress plugins to your website. But be sure you get those plugins from reliable developers such as Home Junction. Poorly coded plugins or plugins that are not updated can actually be harmful to a website. And be sure to go for eye-appeal. Adding a few simple real estate WordPress plugins can make your website a visual wonderland of important images that will have an impact on both buyers and sellers.